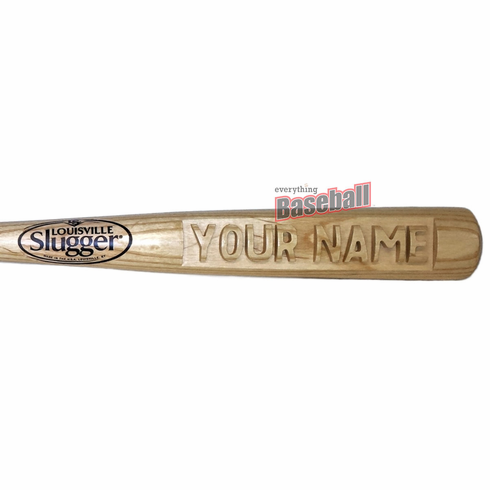 Deep Carved Custom Personalized Louisville Slugger Natural Wood Baseball Bats. A baseball gift that will truly be remembered. Whether you're buying for yourself or for a birthday, holiday or special occasion, these deep-carved personalized Louisville Slugger bats will make the ultimate impression. 27" or 34" Northern White Ash (natural) Louisville Slugger bats are hand detailed and polished to give the feel of finely finished wood. UPPER CASE BLOCK letters...up to 14 characters/spaces on the 34" bat and up to 12 characters/spaces on the 27" bat. Image of Heart or Shamrock can be carved...call for details. Custom image/logo can be carved for larger orders...call for details. 27-inch Deep-Carved Natural Baseball Bat is $64.88. 34-inch Deep-Carved Natural Baseball Bat is $85.88. These bats come with free bat holders for easy display. Choose Combination or Cradle holders. Additional bat cradles and wall mounts can be purchased here - WOODEN BASEBALL BAT HOLDERS! Perfect item to recognize a special employee or for promotional prizes, awards, and/or sponsor gifts. Louisville Slugger is a registered trademark of Hillerich and Bradsby Company.